Compare prices on car hire in Arezzo from all the major brands and find the best deals. When you book through us, unlimited mileage and insurance are always included in the price given. 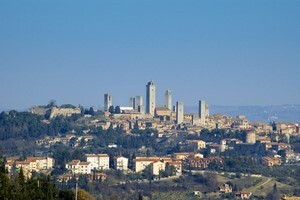 Arezzo is the capital of the province of Arezzo with a population of approx. 90000 (2009). Arezzo belonging region of Tuscany which lies towards the northern part of western Italy. Arezzo is located at the eastern region, about 75 km southeast of Florence, and it is almost equidistant between the Mediterranean coast to the west and the Adriatic coast in the east. Arezzo was an important city of the Etruscans, who ruled the area between ca. 1200 and 550 BC. There are several Roman sites in the city, in addition to a medieval city walls, squares and churches. One of the most famous squares are Piazza Grande with the palaces of the 1300-century church of Santa Maria della Pieve, which was built in the 1100s. Many interesting museums can be visited, including a Roman museum, an archaeological museum and a jewelry museum. Museum Casa de Vasari is the house of the Italian artist and historian Giorgio Vasara who lived in the 1500s. Peretola Airport belongs to Florence and is located approx. 90 km northwest of Arezzo.